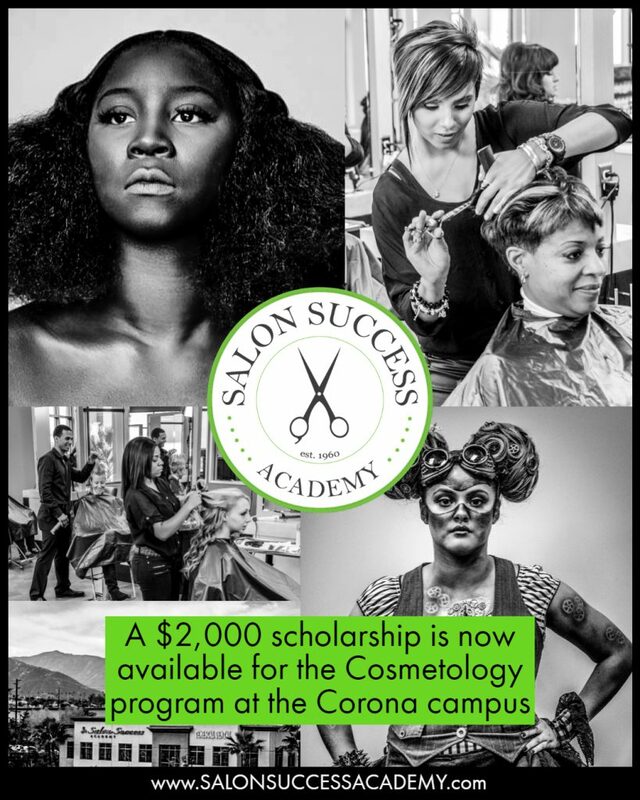 Home \ Our Blog \ About Salon Success \ Is This $2000 Cosmetology Scholarship at Our Corona Campus Right For You? Is This $2000 Cosmetology Scholarship at Our Corona Campus Right For You? Wow! Can you imagine $2,000 off your cosmetology education just because you’re ready to commit now? That’s what you could receive if you enroll for Cosmetology at our Corona campus before the end of 2018. If you’ve always had a knack for hair cutting and styling, it might be time to take those natural talents to the next level. And Salon Success Academy can help. We have more than 60 years’ experience educating cosmetology students and we’re now offering 2000 reasons you should begin your cosmetology training now. This scholarship is only available to the first 50 students who begin the cosmetology program at our Corona campus. There is limited space, so act now. Just fill out the form on this page and we’ll help you get started. Or stop by the Corona campus at 2097 Compton Ave. For more details on our school, the campus, or the eligibility requirements for this scholarship, give us a call at 1-877-987-4247. This is a limited time offer. We only have scholarships available to the first 50 Cosmetology students who enroll at our Corona campus. The scholarship funds will be given to you as an account credit upon completion of your Cosmetology Program. You must be a new student and begin your program by the September 10th class start to be eligible. Salon Success Academy has six campuses throughout the Inland Empire offering hands-on training in Barbering, Cosmetology, Manicuring/Nail Art, MUD Makeup, and Esthetician. If you’ve always dreamed of a career in the beauty industry, stop dreaming and make it happen! Check us out today.